Pondering a Question – Who Converts and Who Doesn’t? I realize I have a diverse reading audience – this article is really intended for a Jewish audience … if you’re a believing Christian, you probably won’t be interested. It describes the experience of the Christian convert to Judaism whose book I am reviewing, as well as questions it has raised for me. At the same time, I discuss similar experiences of other converts that I know. 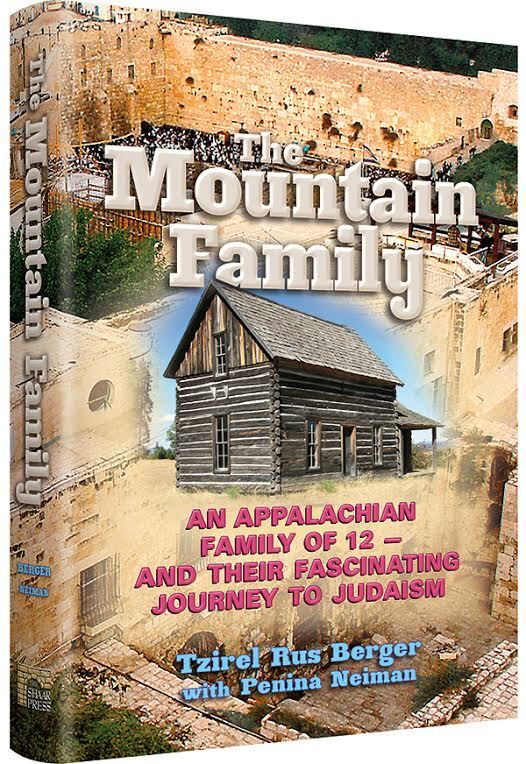 The Mountain Family is the story of Tzirel Rus Berger, a fundamentalist Christian from the deep South (of the United States) who converts to Judaism. Here, the Massey family (the author’s prior name) had already long stopped celebrating holidays which they deem of pagan origin. When other kids went out trick or treating, they simply didn’t participate. At the same time, they’re keeping some semblance of kosher eating and keep some semblance of the Jewish Sabbath from sundown Friday to sundown Saturday. Meanwhile, Berger’s own grandparents had moved to Israel and lived as Christians, but kept Jewish holidays. Meanwhile, their utter faith and trust in G_d is something that, coming from where I do, I look up to even when embodied in non-Jews. I strongly disagree with the advertising for this book about the ‘remarkable’ story. it’s not remarkable because it happens too frequently to retain that adjective. I’ve had the occasion to know many of them. They are typically very strong believers with a very above average knowledge of the actual text. My chavrusa [study partner] at Ohr Somayach was one of them. He was a former Southern Baptist preacher from Tennessee. Fun guy. His father once finally came to terms with his conversation to Judaism, but told him, “Whatever you do, just don’t marry a black girl.” He really tried to obey his father’s wishes but, as Berger points out, marriage prospects for such a convert can be difficult when you come from such a different background. I was learning with my friend throughout his dating and it just wasn’t working for him. He kept getting suggested this one black girl … you can guess the rest. I’ve also heard many of Berger’s issues echoed by converts in my own community. I used to attend the shul of the father of Tuvia Singer. He focuses on anti-missionary work, but as his own lectures state, he didn’t realize how he’d be unwittingly attracting non-Jews. At this shul you can hear some southern accents here and there, or meet people with not-so-Jewish-sounding last names. Echoing some of Berger’s comments, they have questions like “Could it be that G_d isn’t powerful enough that I have to go through an intermediary for Him to hear me?”, “Why does Deuteronomy say not to believe a prophet who does a miracle? Shouldn’t I believe him?”, “Why do we do some things from Judaism but not others?”, “How could people who not even a claim to prophecy add to the written word of G_d?” and “How am I supposed to emulate the ways of a deity that died at 33 when i am 43? What about 63?” Then one day, they decide to read the book from the beginning to end instead of the other way around, and according to different accounts, find there’s no source for the ‘trinity’ in the text, or certain things have been mistranslated or even misquoted in the ‘new’ version, and so forth. Berger describes how no one could answer her questions of interpretation until she started speaking to Rabbis. One of the more interesting stories is that of one of my best childhood friends. His Catholic Priest father and nun mother (yup, that’s correct; read more about them here) still consider themselves Catholic. However, my friend’s own description is that their beliefs are so far from Catholic teaching that it’s hard to say that. I once borrowed some books and tapes of my friend’s father to understand the perspective. The tape was an interview arguing that since the mishnah [Jewish oral law] says one should be married, surely the guy the Christians calls the messiah must have been! In one of the books, it outlined the atrocities of the church throughout history that could only be written by an insider, and argued for going back to the Jewish routes … the book mark was a version of the famous painting of the “Last Supper” except the participants were all wearing yarmulke’s and tallis’s [Jewish prayer shauls]. Meanwhile, my friend who had gone from Catholic to atheist back to Catholic, when I last spoke to him, was working in a bookstore at a Catholic retreat where he reads “anything about G_d” all day. I asked him if he could get a “promotion” and actually teach some classes there. He said they’d never let him do that because he didn’t believe in the virgin birth! Still, I have wondered why some very seriously believing Christians who have such fundamental issues with Christian theology convert to Judaism and other’s don’t. One acquaintance of mine was amongst his 7 siblings converting to Judaism, but related that his father could not be converted as he believed “the messiah had been here once already”. Otherwise, his father lived in the Old City of Jerusalem and acted completely like a Torah observant Jew. There are all kinds I suppose. A corollary question in mind has also been … what’s the allure? How can you believe in a version of G_d which posits that G_d is not infinite enough for you that he needs to come down in man form that you pray to? Some of it is emotional connection to the past – in fact, my friend’s Priest-father (father-Priest? ), in writing about almost two thousand years of mistakes by his church, wrote so lovingly about his aunt, a nun who was so pious and kind. It was not something he could, would, or does emotionally leave behind. I think the answer can also be summed up in what’s actually a Jewish story from a chassish Rebbe. In jewish law, we pray the morning prayers by a certain time. After the fact, you can do so the entire morning. Chassidim are often known to pray in the less desirable time. A Chassid was once mocked by a Litvish [good with time] Jew who asked him why he couldn’t pray on time. The Chassid said something like, “In truth, I wish I could be like you and just come to synagogue and start praying right away. The problem is that I stop and think about the awesomeness of creation and all there is to it and the amazingness of our infinite Creator and I just tremble and can’t move past it. It takes me hours each day to actually summon up the ability to compose myself talk directly to the Creator. I don’t know how you do it right away, but you are so fortunate.” It’s a difficult avodah [service] to connect properly all the time. It’s a way of life and a discipline. So man, in fact, Paul created a system to make it easy. They’ve created a “blue pill” but for those who want the “red pill” it’s out there. Actually, as one who also has known many converts (and is married to one – see our book – “Doublelife: One Family, Two Faiths and a Journey of Hope”) I think it is absolutely remarkable, no matter how frequently it may happen. And that it is happening more and more frequently is also remarkable. Every convert’s story is amazing in its own way.